The British leg of the flagship series of single-seater inshore circuit Formula 1 powerboat racing – the UIM F1H2O World Championship Grand Prix of London. The spectacular, high-octane event will be held at East London’s historic Royal Victoria Dock for the first time since 1985 on 15-17 June 2018. 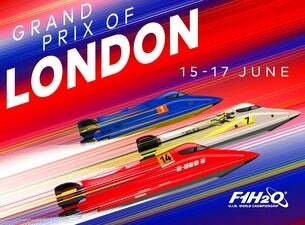 The UIM F1H2O World Championship Grand Prix of London will offer spectators a breathtakingly up-close and personal opportunity to watch the lightweight, tunnel-hull catamaran powerboats battling each other into turns at over 90mph and hitting speeds of up to 140mph on the straights. On Friday the F1H2O powerboats will have a free practice session. On Saturday qualifying will see the 10 F1H2O teams battling the clock and vying for pole position. While on Sunday afternoon racing will get underway following an hour’s free practice session and a parade lap. As well as watching 10 teams battle for the F1H2O Grand Prix of London title; spectators will also be treated to nine teams competing in the Formula 4-S class, in which the sport’s up-and-coming drivers learn to hone their skills. While Formula 4-S powerboats have less powerful engines (60bhp) than those in F1H2O, they still manage to reach speeds of over 70mph. There will also be demonstrations over the course of the weekend from historical powerboats; jet skis; a 14-metre, five-tonne, V12 Class 1 offshore powerboat, which will hit a straight-line speed of up to 100mph; and junior, entry-level powerboats piloted by the next generation of British talent.